Spur gears and a rack from Ronson Gears. RONSON Gears is one of Australia's leading gear manufacturers and a leading stockist of gears and racks. The range is extensive and is ideal for that 'quick fix' or for standard gear requirements. 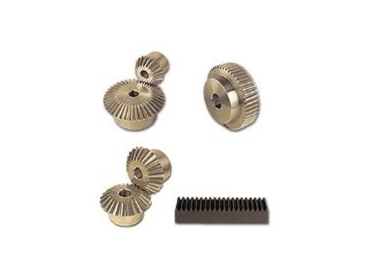 Ronson's spur gears come in both metric (1 module to 4 module) and imperial sizes (16DP to 6DP) while their mitre gears and bevel gears are in imperial only. Their racks also come in metric and imperial and the gears are made from K1045 and the racks are made from a mild steel. All items are available off the shelf. Ronson Gears also provide a 'Stock Plus' service, which includes further machining, keyways and set screws at a minimal cost. You can find Ronson's entire range of stock gears and racks on their website, www.ronsongears.com.au. For a free catalogue contact Ronson Gears on 03 9555 9822.